1. Kirkgate market hall, Leeds, 1901-04. Leeds’s Kirkgate market hall is one the best surviving Victorian retail buildings. Opened in 1904, it still retains much of its original decoration, including the numerous cast-iron wyverns (two-legged dragons) on the ground floor (1) that are in fact brackets that support the gallery level above. These outsized monsters are a curious legacy of the Victorian fascination with the grotesque and a reminder of a vanished way of thinking about the value of the decorative in civic buildings. But what do these particular wyverns mean? Surely not mere whimsy, ornament for ornament’s sake? After all, this was a public building, built with hard-earned public money. Why did Leeds’s civic authorities deem it necessary to include wyverns in the people’s market hall? 2. Halifax market hall, 1896. 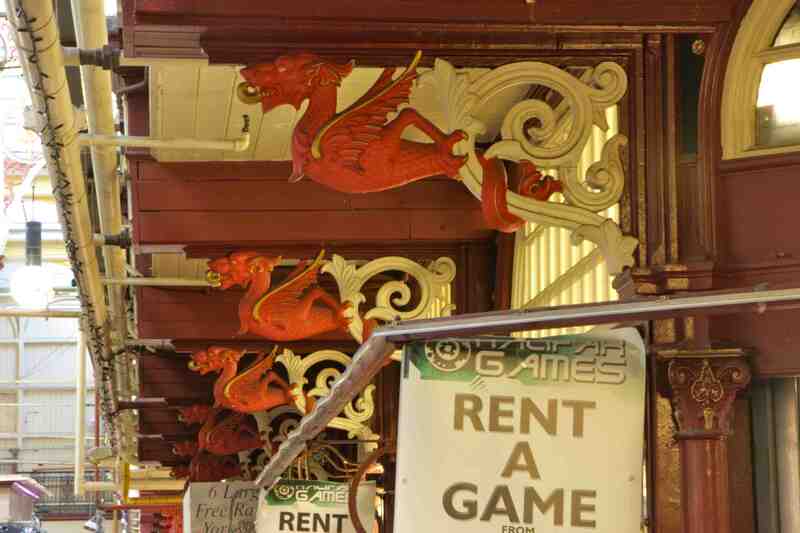 In fact, these wyvern motifs were specified by the architects of the market hall (John and Joseph Leeming) in their original competition drawings for the project and developed from similar ones they used in an earlier market hall in Halifax (2; 1896). In the late nineteenth century, dragons and their wyvern cousins were both common heraldic motifs in Britain and were also associated with industry; in 1845 the Midland Railway adopted a wyvern as the crest in their unofficial coat of arms, believing it to be the symbol of the ancient kingdom of Mercia, or the Midlands as it effectively was in the Victorian era; the company incorporated cast–iron wyverns into luggage rack supports, bracket signals, and the spandrels at Hellifield railway station (3; 1880). 3. Hellifield railway station, 1880. Despite their appropriation by the Midland Railway, wyverns and dragons were generally perceived in the Victorian period as a menacing symbol associated with the devil; it was John Ruskin, in Fors Clavigera – a series of letters, published in the 1870s, addressed to British workmen – who drew on the sinister associations of dragons when he directly equated them with what he regarded as the hellish consequences of rampant industrialisation. 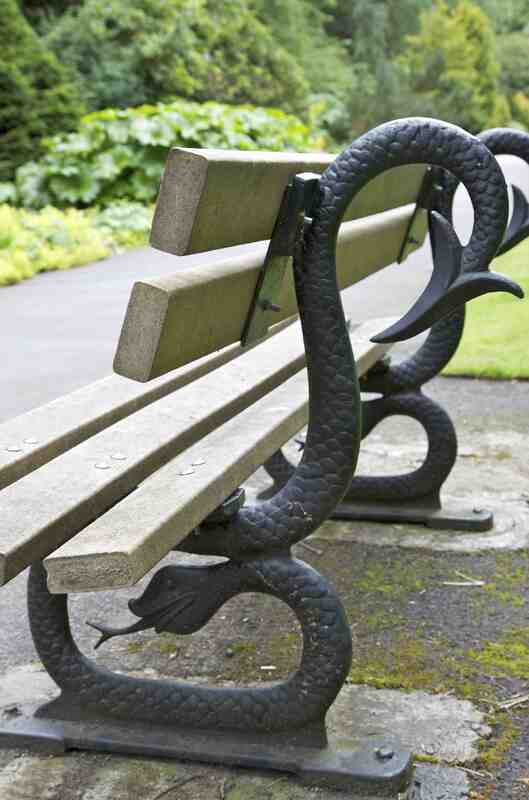 Significantly, Ruskin was prompted to make such an association after he discovered the motif of a cast–iron dragon/serpent on a metal bench (4) whilst walking in the picturesque Lune Valley in Lancashire; he reacted in horror to what he perceived as a satanic emblem fouling one of the loveliest beauty spots in the English countryside. 4. Bench in Valley Gardens, Harrogate, c.1880s. 5. 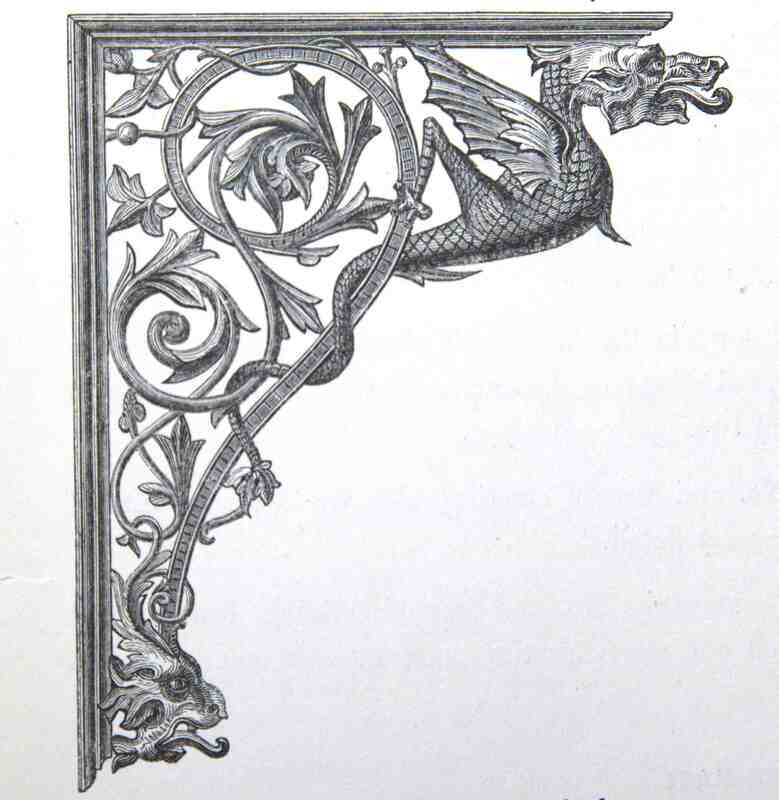 Cast-iron bracket from the sixth edition of Macfarlane’s catalogue, 1882. 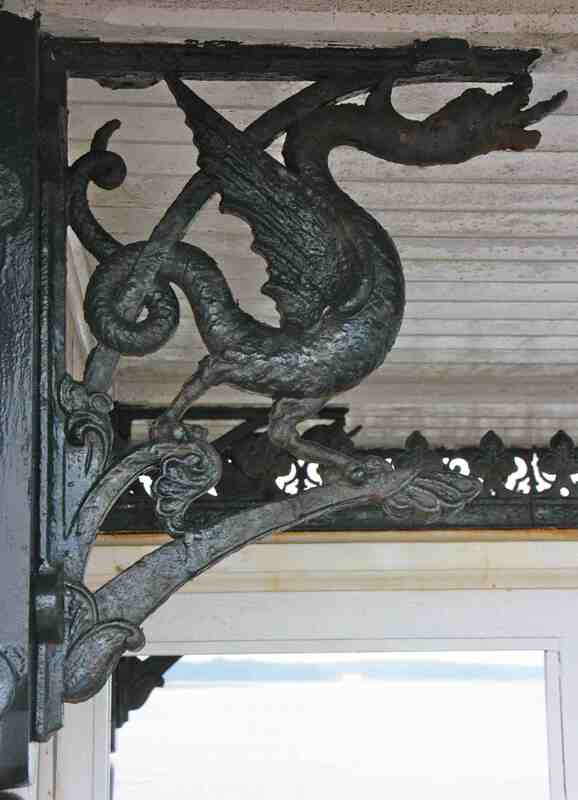 Despite Ruskin’s chagrin, cast–iron dragons and wyverns were a common motif in both Victorian street furniture and seaside architecture, as seen in many designs included in Walter Macfarlane’s catalogues in the 1880s (5), which were probably inspired by their earlier adoption by the Midland Railway. 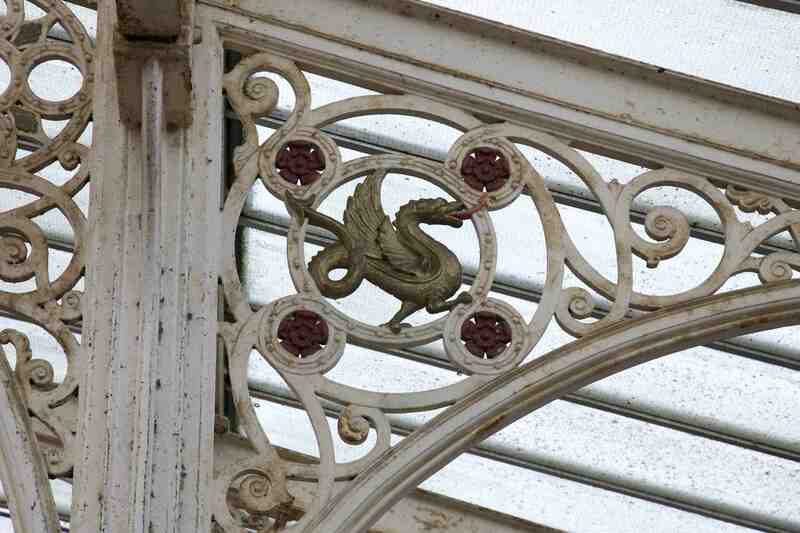 In contrast to Ruskin’s emphasis on their sinister implications, cast–iron dragons were often associated with the “exotic” cultures of the Far East, particularly in seaside architecture (6); the wyverns adopted by the Midland Railway and the architects of Leeds’s market hall, however, were more likely viewed as symbols of protection, industrial power, or as denoting ancient indigenous mythic pasts. 6. Wyvern bracket in the shelters on Ryde pier, 1880s. 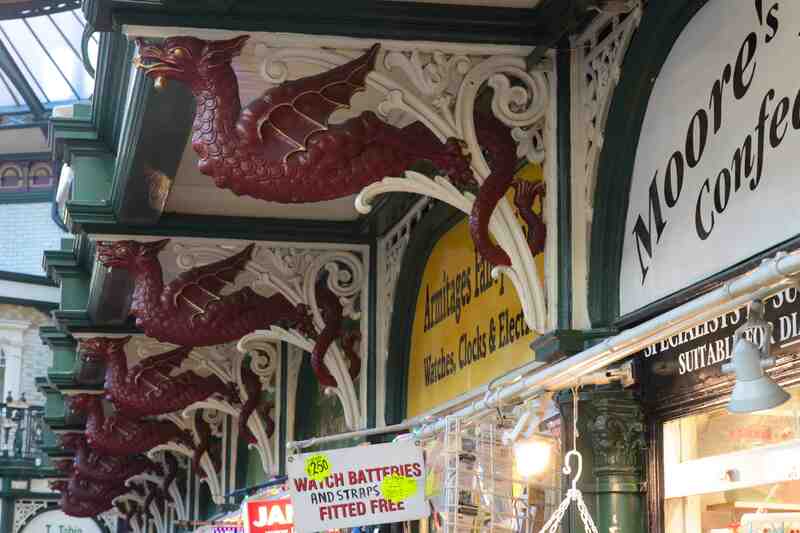 Moreover, the significance of the wyverns in Leeds’s market hall (1) is heightened by their repetitive use – an inherent characteristic of cast–iron reproduction. Here, repetition lends both added emphasis to the sense of civic power articulated in this building and also a direct visual sign of the material abundance that the new market hall promised to the city’s citizens. Thus, the lavish ornamentation of market halls like Leeds’s not only symbolised the promise of abundance, but also enacted it in its spaces by creating a more abundant supply, lower prices, and higher quality in meat and poultry. A very interesting post with great images. There is certainly a contrast where cast iron is an indigenous production as in the UK, as opposed to places where the ornamental iron was imported. Thanks for this. My focus is very much on British ironwork, but there’s a huge amount of British-made cast iron overseas that’s received very little attention (particularly in South Africa and South America).